We offer various styles of loyalty programs that will compliment your customer retention strategy. You can choose one, all, or any combination of loyalty programs to suit your needs. Use your program with cards, or without them. You can also offer tiered membership levels such as "Bronze / Silver / Gold". With all of our loyalty programs, your customers can sign up online via your website or in-store with your staff. Customers can easily access their point balance and history at any time, plus the system allows you to send an automated emails to customers after each transaction. Our flagship (and most popular) product, the points program will allow you to award points for money spent or specific customer actions. The points program is versatile, allowing you to award any point-to-dollar ratio you'd like. You can configure custom reward levels to be reached, and assign specific permissions for staff members to give you complete control over your program. You may wish to add special promotions such as "Double Point Tuesday" or offer bonus points for customer actions or referrals. Get rid of your old punch cards and upgrade to a modern, secure, and trackable system. Like the name suggests, this program lets you reward customers based on multiple product purchases such as "Buy 9 coffees, get the 10th free". Track how many times specific items were purchased and discover the most popular products among loyal members. Use this program with or without cards! This program allows you to reward customers based on interactions or events instead of dollars spent - for example, "attend three cooking classes and receive a free recipe book". There are a wide variety of ways this program can be used to encourage specific customer behavior however, it's most commonly used as a referral solution. The name says it all. This program will allow your customers to buy pre-paid cards that are reloadable at their convenience. Once registered, the value is stored within the customer's account so you can use this program with your own custom branded cards or no cards at all. 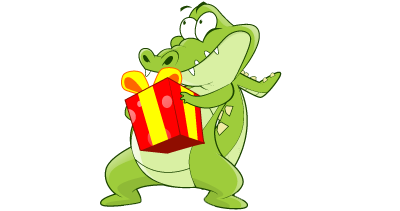 Commonly used as a gift card program, the Loyalty Gator system allows you to collect valuable customer data and enables you to track visits and frequency unlike most other gift card programs! A specialty program that allows for a percentage of each transaction to be added to a separate campaign. Popular for referral networks, shopping centers and more! Learn more about two-tier loyalty programs. A specialty program that incorporates multiple merchants under one loyalty program. Customers can use one loyalty card (or account ID) across all participating merchants to earn points on purchases. Staff permissions are restricted to their own store(s) to protect merchant privacy. Find out more about the coalition loyalty program. Your program, your way. Check out all the features and try us free!